I had so much fun decorating these eggs and making this video, I hope you enjoy! Drop a few drops of nailpolish into your water cup in concentric circles. Use your toothpick or skewer to swirl and swoosh the colors around in your cup. Dip your egg into the cup, and use your toothpick to clean up around the edges. Lift your egg from the water, and let it dry on the side. Sneak peek- upcycled and thrifty DIY’s coming up! How fun! I have been wanting to do this with mugs 🙂 Love your blog. Follow for follow? I will try to keep you posted! From what I read they would need to be hand washed. Help I’ve bee trying to do this for 2 days. My polish doesn’t spread? Can you eat them after using this technique? 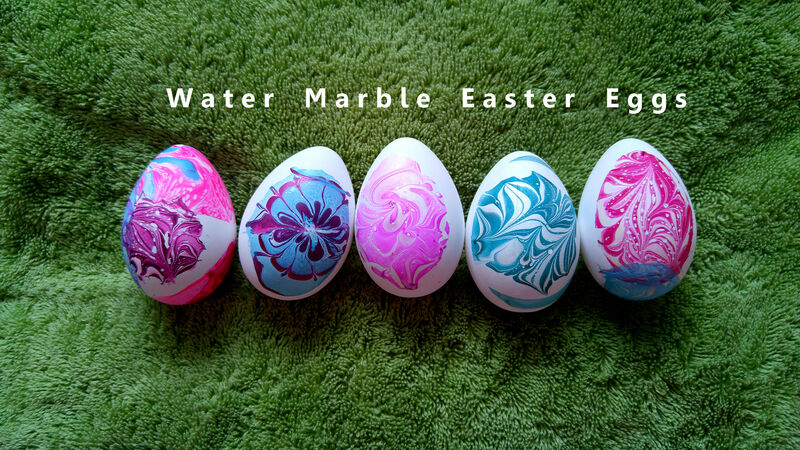 Really fun way to decorate eggs. I failed at most of them, but still fun to try. This is my first time seeing your blog,,i love the way the eggs marble…I see you with the pick on the sides of the egg but cannot see what exactly your doing with it…. Hi Bella, and happy easter! I am using the pick to pick up some of the leftovers that did not stick to the egg. That helps the design stay clean when you pull the egg out of the water! 🙂 Hope this helps!